As expected Lionel Messi won his 4th FIFA Ballon d’Or award on Monday night, finishing ahead of Real Madrid’s Cristiano Ronaldo and his Barcelona team-mate Andres Iniesta, who finished second and third respectively. Although the identity of the winner came as no great shock, there were surprises aplenty at the star-studded gala held in Zurich. Each country’s national coach, national team captain, as well as an established football journalist from each country was allowed to vote and there were signs this year, perhaps for the first time, of some tactical voting taking place. It’s not at the levels of Eurovision block voting, but there were definitely some outliers this time round. Lionel Messi, for instance, who was eligible to vote by virtue of his captaincy of Argentina, somehow managed to exclude Cristiano Ronaldo from his top 3. In what appeared to be another calculated snub, Portugal captain Bruno Alves went for his teammate Ronaldo as top pick with Messi not in the top three. Spain goalkeeper Iker Casillas opted for club and international teammate Sergio Ramos as his No.1 pick, with Ronaldo only second ahead of Iniesta, perhaps shedding some light as to why the Portuguese striker revealed last year that he did not feel loved at Madrid. There were one or two oddities among the votes. For instance, one of North Korea’s votes went to Wayne Rooney, which indicates that not only is the country cut off from the rest of the world culturally, but that when it comes to football, they are still watching re-runs of Euro 2004. Here’s the full breakdown of all the votes, from players to coaches to assorted journalists. 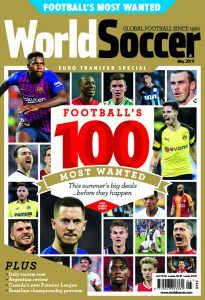 The FIFA FIFPro World XI of 2012 selected 50,000 professional players, appeared to have been dazzled by the dual beacons of Real Madrid and Barcelona with 10 of the XI coming from those two clubs – only the selection of Atletico Madrid’s Radamel Falaco broke up that cosy little duopoly. I don’t think many people would have a problem with the majority of the names picked but there are one or two glaring inclusions. For instance, it’s arguable whether Marcelo is even the best left-back at Real Madrid let alone in world football and for all Dani Alves attacking forways, surely he would conceded that he is not the best right back in world football. FIFpro World XI: Casillas – Alves, Pique, Sergio Ramos, Marcelo – Xabi Alonso, Xavi Hernandez, Iniesta; Messi, Falcao, Ronaldo. Brondby have confirmed that wages at the Copenhagen club are to be cut by 25 percent across the board. “We hope and believe that all employees will agree to this as it is the key to securing the short and long-term capital and liquidity and the continuation of the club,” chief executive Tommy Hakansson said in a statement. I’m not sure what the legal position is with regard to staff contracts, but the fact that Hakansson says he ‘hopes’ the employees agree to the cut, does not inspire confidence that they actually will. After all, age of austerity notwithstanding, losing a quarter of one’s salary is always a bitter pill to swallow. An initial 10 percent wage cut is to be introduced immediately with a further 15 percent coming in three months. Brondby are bottom of Denmark’s top-flight with 17 points from 20 matches. Juventus coach Antonio Conte reportedly has been cleared of more match-fixing, this time stemming from when he coached Bari from 2008 to 2009. Inter and former Bari defender Andrea Ranocchia also was reportedly cleared. Among those named as being under investigation are current Torino and former Bari goalkeeper Jean Francois Gillet and Conte’s former assistant, Cristian Stellini. Nearly all of the others are also former Bari players. Conte was banned for four months at the start of this season for failing to report fixing when he coached Siena two seasons ago. He remains under investigation by prosecutors in Cremona. Two of Bari’s Serie B matches were allegedly fixed – Bari-Treviso (0-1) on May 10, 2008; and Salernitana-Bari (3-2) on May 23, 2009. Bayern Munich have laid down their marker when it comes to player discipline by fining Bastian Schweinsteiger and Toni Kroos for wearing the wrong socks at training. The Bundesliga leaders are currently enjoying a mid-winter training break in Qatar – but any suggestion that the sojourn is a mid-season holiday, have been proven unfounded by the decision to punish the duo for turning up for training in white socks rather than the regulation black ones. Bild reports that captain Philipp Lahm was ordered to decide on the size of the duo’s financial punishment and then collect the money from them. According to a report in today’s Mail, the pitch at Borussia Dortmund’s Signal Iduna Park stadium receives some additional care ahead of the resumption of the Bundesliga season. An eerie light shone on to the pitch is the result of a hi-tech ‘artificial sun’ lighting system used by the German champions to keep their pitch in perfect condition. Click on the link to see the pitch bathed in a haunting Dortmund, yellow light. 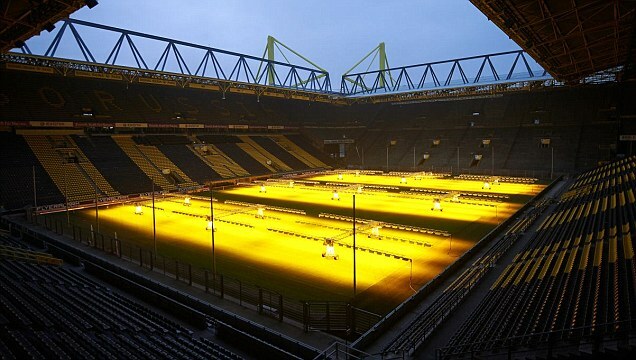 Given the stature of the 80,645 capacity stadium, much of the natural light does not reach the pitch, so for the past two years, Dortmund have hired Dutch company Stadium Grow Lighting (SGL) to construct a portable grid of powerful lamps above the turf in between matches to ensure the grass gets all the necessary nutrients. Milan owner Silvio Berlusconi explains why Pep Guardiola will not be coaching Milan next season. Coincidentally, Manchester City have recently recruited former Ferran Soriano and Txiki Begiristain from Barcelona. Seamus Coleman took one touch to control the ball and a second to lift it over the goalkeeper’s head in Everton’s 5-1 FA Cup victory over Cheltenham. Germany’s Ghana-born former international Gerald Asamoah has criticised ex-captain Michael Ballack and other international team-mates for failing to speak out against racism in the game. In his autobiography, excerpts of which were published in Monday’s Bild newspaper, Asamoah describes how he was racially abused while playing for Schalke against Hansa Rostock’s reserve side in the German Cup in 2006. Asamoah, who represented Germany at the 2006 FIFA World Cup, said the abuse was well-publicised at the time and had been so bad the referee wanted to abandon the game at half-time. However the midfielder said he waited in vain for any support from his international team-mates. “The fact is I would have wished at the time for a reaction from former players in the national team and especially from the captain (Ballack) – a clear statement against incidents like these,” Asamoah wrote in the book. Asamoah, 34, who now plays for Bundesliga side Greuther Furth, said he had thought about quitting the national team at the time. “What sense is there, I thought, in playing for a country whose fans don’t want me?” he said. 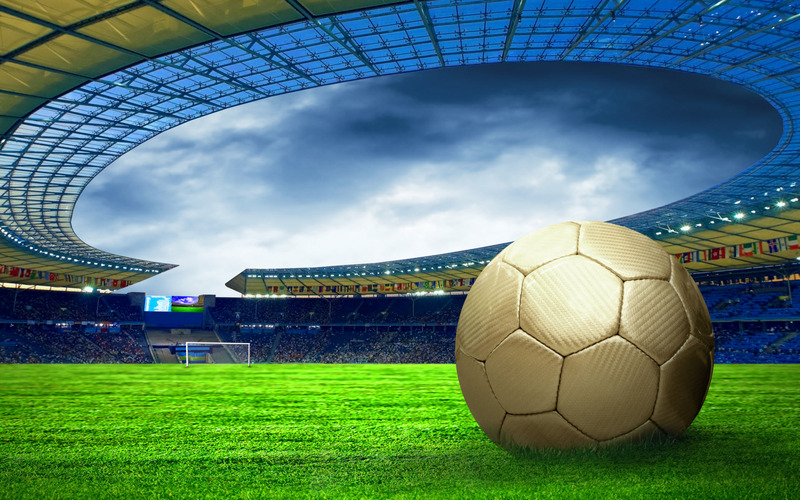 The shockwaves caused by the death of a linesman officiating at a youth match in Holland last month appear not to have reached all parts of the world. Here’s footage of a referee and his assistant being attacked during a brawl which broke out at a football match in Chile. However unwelcome the prospect of Silvio Berlusconi running Italy might be, it does at least keep him busy and provide a welcome distraction from one of his other jobs, that of running Milan football club. Berlusconi has dismissed speculation that the club could sign Mario Balotelli, describing the Manchester City forward as a “rotten apple”. It had been mooted that Balotelli could be brought in to replace the already-departed Pato and the expected-to-leave Robinho, but the Milan president has ruled it out. “The name of Balotelli never came into my thoughts, he is a rotten apple and could infect every group where he goes, even Milan,” he said to reporters. One player who would be welcome at the club, somewhat surprisingly considering he has just left it, is Corinthians-bound Pato. “Pato will return to Milan in one or one-and-a-half years. His injuries distances him a bit from Milan, but I made a deal with him,” Berlusconi told Antenna3.